I’m very, very glad to be on the backside of July. Because man, was that one packed month. Most of the busy came from work. I’d been working at one specific desk in my department, booking one specific kind of talent and writing contracts for them. Now I’m at a different desk, writing contracts for a completely different kind of talent. Which you’d think would be similar, but they’re done in completely different ways, and it’s surprisingly hard to get your head working in a different direction. At any rate, I wasn’t able to dedicate all of my time learning the new job, since I still had to do the old job, so for a couple of weeks I’d hop over to the new desk for an hour or two at a time every day, and learn a small portion of the job, and scribble down notes. And of course, in a 20-step process, that means learning step 17 one day, then moving on to step 8 the next day, then learning both step 4 and step 11 the next. It’s only now that I’ve been doing the job for a week that I’m seeing all of the steps in order, and things are clicking. Add in that during this fortnight, while learning the new desk, the other person who did my old job (several of the desks have two people splitting the load) was on vacation. So I spent two weeks covering two desks while learning a third. Then after that, I got to spend a week training someone to do my old desk, while still popping over to the new desk and learning more little tidbits there. Yeesh, I’m tired just writing about it. But I made it through. I’m slow now, because I’m going over everything a thousand times, and I’m consulting my notes on every step. Time will bring up my speed. Things are good in the homestead. Scott went off to San Diego Comic-Con, and had an enjoyable time. I considered going, for a short while, but eventually realized that the very thought of it was making me panic. Too many people, too small a space, unknown city … I would have been a crazy panic panda the entire time. Once Scott got there, he confirmed that me staying home was the absolute right choice. 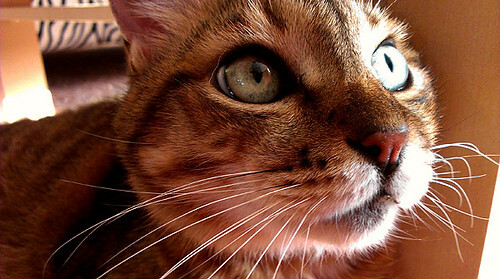 The cats are doing well, and remain the most beautiful cats in the world. With the kissiest little faces. Look at Commie’s little face! I think I’m going to go give him a smooch right now. 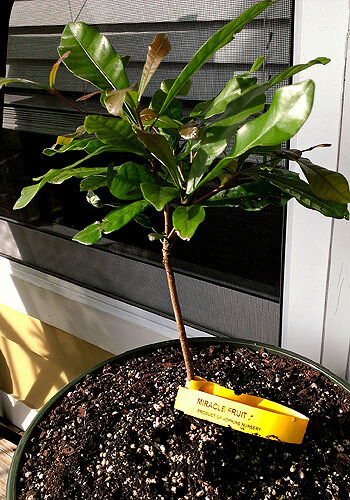 I’ve acquired a Miracle Fruit plant, because I’m crazy that way. If you haven’t heard of Miracle Fruit, it’s a small berry that you crush in your mouth and swish around, and then for a couple of hours afterward, sour things taste sweet. You could eat a whole lemon, and it would taste like amazingly sweet lemon candy. There’s a chemical (called “miraculin,” hilariously enough) in it that alters the receptors on your tongue. Finally, we’ve finally become people who put little family decals on the car window. 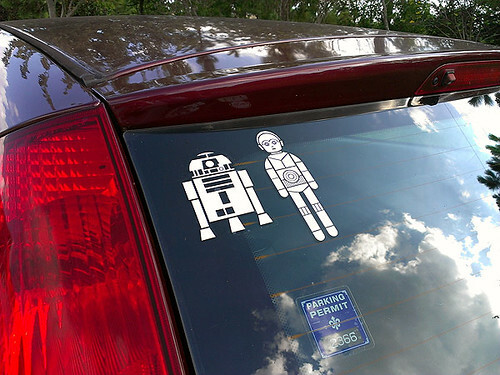 These are the Star Wars family car decals from ThinkGeek. Which are, sadly, out of stock right now. They came in a set of 50, so we have Jawas and Vaders and Lukes and such galore. What to use them on … hmmm. These particular choices are based on How to Decide Which Star Wars Character You Are Most Like, in which Rick imagines us as we really are.